Home » Gadget » ZTE Nubia Z18 Mini Official Released, Its Price? ZTE Nubia Z18 Mini Official Released, Its Price? ZTE officially re-launched the new smartphone titled Nubia Z18 Mini. Smartphone which is a variant of the Z18 Series is targeting the middle class segment. ZTE Nubia Z18 Mini is equipped with the key specifications of the typical middle-class smartphone. To support its performance, this smartphone relies on Qualcomm Snapdragon 660 processor, 6GB RAM, and 64GB / 128GB ROM option. This smartphone also supports the expansion of external memory storage through the presence of MicroSD slot. In the sector of photography, ZTE Nubia Z18 Mini is equipped with dual camera 24MP (f / 1.7) + 5MP on the back and on the front camera has a resolution of 8MP and f / 2.0 aperture with wide viewing angle of 80 degrees. The rear camera can shoot in Portrait mode, while the front camera can scan face points up to 106 points in detail and accurately, for use in the face scan feature to unlock the device. In addition, this smartphone comes with a fingerprint scanner where the panel is placed on the back. ZTE Nubia Z18 Mini features a 5.7-inch IPS LCD screen with a resolution of 2,160x1,080 pixels, 18: 9 aspect ratio. The design has a premium concept with a surrounding frame using aluminum material and the screen is protected by Corning Gorilla Glass. At the time of launch, ZTE Nubia Z18 Mini is offered in several color choices namely Black, White, Light Blue, Purple and Pink. In addition, ZTE Nubia Z18 Mini equipped with key features in it, namely support AI technology specifically designed for smartphones called NeoSmart AI. This feature comes with a dedicated sound button. 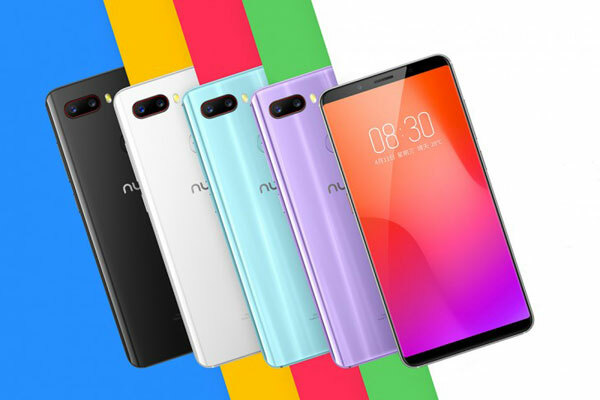 ZTE said that it has opened a pre-order Nubia Z18 Mini in China starting April 12, 2018 and orders will be delivered from 19 April. Unfortunately, there is no further information about the availability of this smartphone in the international market, including to the homeland. Related prices, 64GB ROM model will be priced € 230 (Rp 3.9 million) and 128GB set at a price of € 270 (Rp 4.6 million). Meanwhile, ZTE Nubia Z18 Mini Provence Limited Edition (available in Purple color variant) is priced at € 280 (Rp 4.9 million). 0 Response to "ZTE Nubia Z18 Mini Official Released, Its Price?"